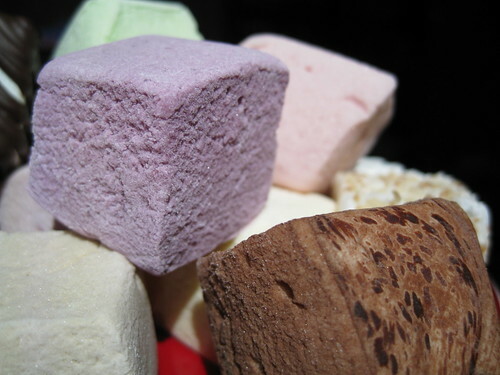 I used to think marshmallows were the most lifeless sweets around – it often felt like they were made by insulation experts, and not confectioners setting sugar and gelatine into little squares of magic (and dental havoc). Then I had artisan marshmallows – and realised it’s not even in the same orbit as the tragic packing foam that is sold on most supermarket shelves. 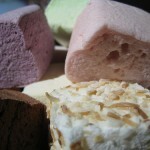 The first fancy marshmallows I had were as petits fours in really shmick restaurants – the passionfruit ones at Rockpool and Bentley, the green tea versions at Tetsuya’s – but it wasn’t until Sweetness The Patisserie that I had proper jumbo-sized mallows that were pillowy, soft, stretchy, pull-apart-able and buffered with full-volumed flavour. Sophie lives close to the store in Epping and treated me to my first Sweetness mallow earlier this year – it was a Cherry and Coconut single-pack and I remember it tasting like a luxury version of a Cherry Ripe – it was a real moment-stopper. 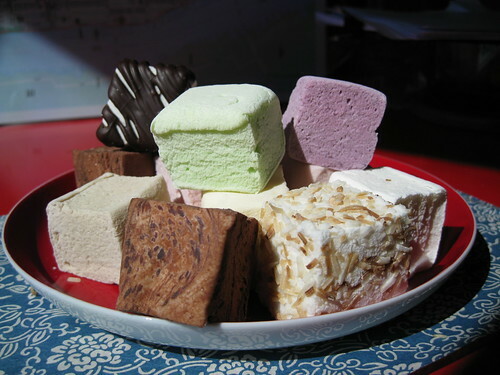 Then I made Will trek to Epping (from Bronte) to pick up bundles of mallows when he needed food props for his last lighting class (he never ended up shooting them, but we enjoyed eating the soft lime, raspberry and passionfruit squares in his kitchen). More recently, unable to outsource my Sweetness fix to anyone else, I caught the train to Epping to stock up on a few bags. The patisserie is on a quiet street right near the station and the atmosphere inside is really charming – in a jokey way, I’d say it’s sort of “Bowral meets of South of France”: there’s iron-wrought furniture, treats under glass domes, and a rustic clock and a vase of gum leaves above a country-style wooden shelf. 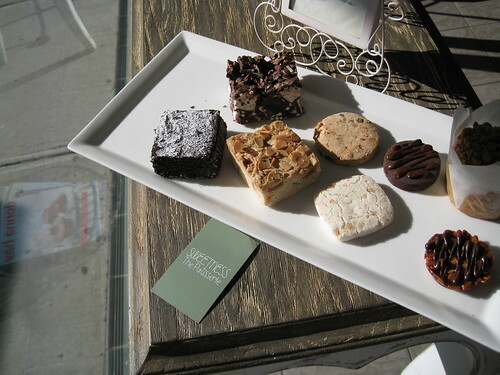 Behind the counter, you get a front-row view of apron-wearing staff prepping trays and working on sweets. It’s a nice, intimate space that has old-school flourishes – it’s worth a visit even if your Sweetness treats are available at a local market. So, thanks to this place, I’ve gone through a bit of marshmallow reform – from non-fan to someone who swears loyalty to about every flavour on the shelves. My favourites are the zesty lime; the sweet, zingy raspberry; the subtle coffee; and the gorgeous, gorgeous chocolate. In prying a packet of the latter open, an aroma-cloud of cocoa hits you – and just that choc-thick fragrance is dreamy on its own. One dinner, Will and I decided to go halves on mallows and it was super-fun to see these springy, thick confections slowly give way as we pulled them apart. 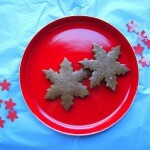 These aren’t sweets that disappear or melt to nothing, they’re beautifully sinkable and worth lingering over. Sweetness courts sweet-tooths in other ways – there are muffins, nougat and cakes on display – but the idea of a shop that masters marshmallows is a unique one. I wanted to find out more about how it came to happen, so I had a chat with Gena Karpf, the person behind it all. 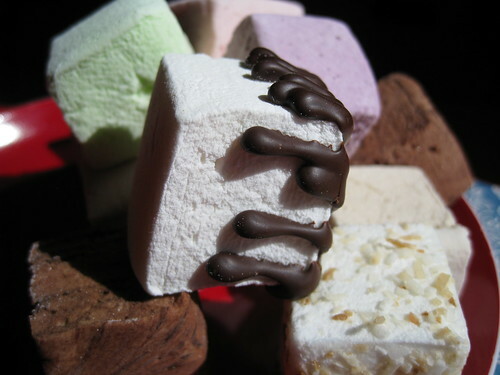 Why a marshmallow boutique in Epping? Other reasons that directed her to 38 Oxford Street, Epping – one, it’s very close to the station and two, it was near the Cordon Bleu school where Gena was studying at. “That’s where life took me,” she explains. How many marshmallows emerge from the kitchen? What’s the most difficult thing about making marshmallows? 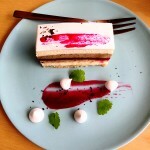 “Texture is harder than flavour. In a bowl, you can create something that tastes great. Aeration is different – raspberry is difficult and mango, too, the pulp gets in the way of aeration. The key is maintaining texture while having the right flavour profile. We did a pinot noir marshmallow, which was very successful. We tried a champagne one [and in trying to translate the fizziness and lightness], it didn’t work. “We use fruit purees and juices, and we don’t use any preservatives and we don’t know what one looks like. It means the marshmallows have a short shelf life. 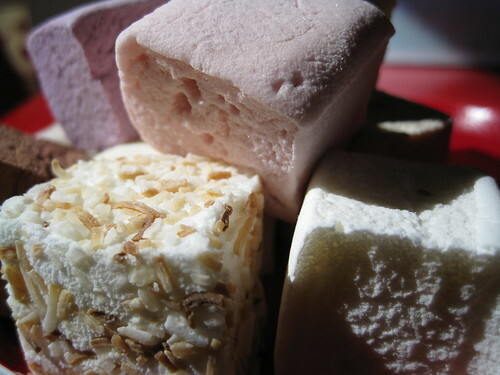 What are the most popular marshmallows? You were working at IBM when you first started experimenting with marshmallows. Can you remember that original batch you made? 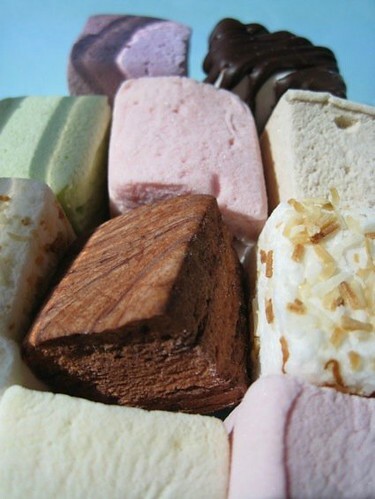 What do you think of the marshmallows that are served as petits fours in fancy restaurants, like Rockpool? “They’re so tiny – they’re decorative, complimentary, they exist for an entirely different reason. 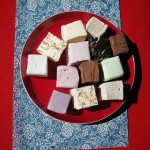 Our marshmallows aren’t just an accompaniment to a dessert. But if these [restaurant marshmallows] were a stand-alone item and something you could sink your teeth into, I would expect the quality to stand up. Do you find yourself sizing up whatever you happen to be eating as a potential new marshmallow flavour? 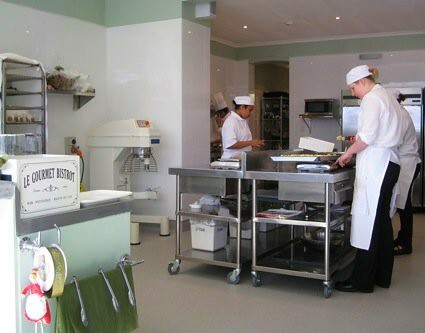 “It can be confusing if there’s too many flavours – it’s difficult for customers. More is not better. “Currently, we’ve got a Mixed Fruit (with guava, banana and other ingredients) but people are going to buy raspberry over mixed fruit. Besides the Christmas range in November – which will include Gingerbread and Peppermint – what are other flavours you want to work on next? 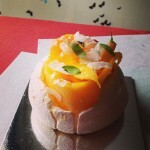 “Summer fruits – such as lychee, mango, cherries – that’s what we want to focus on. “I’d also like to do a pumpkin marshmallow in the tradition of American Thanksgiving. I’m not entirely sure if that will be successful – Australians aren’t used to pumpkin as a sweet ingredient. And technically, it’s a challenge – pumpkin has a lot of texture – and aerating it will be a challenge. You talked previously about how it’s important not to have too many flavours. How much is too much? “5-8 flavours is about right. 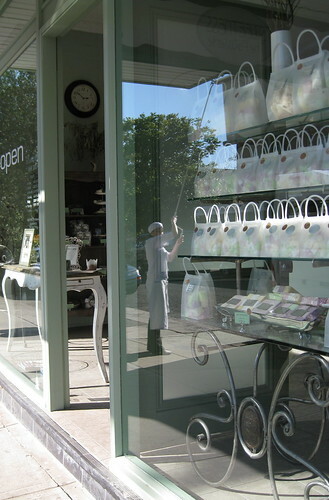 And with macarons, I never want to have eight types of macarons in the store – three is the right balance, manageable. “And if you come in and want the lemon poppyseed macaron that was sold last week, or if you say you’d like the raspberry choc muffins with strudel on top, without raspberry – maybe next time, when we do our batch, we can set aside six for you. I love the taste of Passion fruit, but I am having a hard time imagining how a Passion fruit marshmallow would taste like. Great post! Mm hmm, those passionfruit ones are super amazing. Interesting to hear that they’re not going crazy on the flavours. And why would you, when the ones they have are so good? Beautiful photos too, by the way. thank you so much for this super post!! 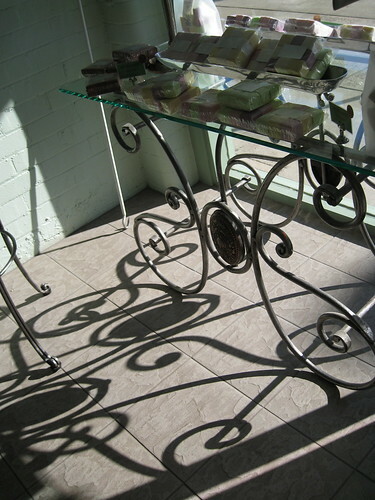 I am a regular of the sweetness at the castle hill markets and I am SUPER excited about this shop! I mean, I guess they would have a shop, but I have only seent he markets!! Thank you so much for this beautiful post. I found your description so desirable I have contacted sweetness to post some out to me asap. They were super helpful and I am so looking forward to trying the marshmallows – I have ordered Rosewater, Lavender, Raspberry and Chocolate. I worked there for 5 weeks and got such a wonderful experience there.. even I personally don’t like marshmallow, I still think Gena’s marshmallow is very beautiful .. and her biscuits are the best ! Thanks everyone for your marshmallow-sweet comments. I hope Linda that your bags of rosewater and raspberry squares were worth the postal wait and BSC, that is cool that you spent time behind the actual Sweetness counter! LOVE these mallows! Passionfruit is my favourite. Also fabulous nougat – fresh and full of flavour. They also do the Nth Sydney Growers Markets every third sat of the month.